The 5th annual She Rocks Awards was presented last night at the Pacific Ballroom of the Anaheim Hilton. The sold out NAMM event was a triumphant celebration of women in the music industry. Created by Laura B Whitmore, the event has grown from an early morning breakfast gathering five years ago (which Australian Musician attended) to become one of NAMM’s flagship events. The night kicked off with a red carpet reception which featured many of the event’s guests including Garbage’s Shirley Manson, Esperanza Spalding and Lisa Loeb. Inside a rocking’ group of musicians was assembled as the house band, many of whom appear on the She Rocks Volume 1 compilation album, which was released on the day. Honourees on the night included Shirley Manson, Esperanza Spalding and the great Ronnie Spector, who was thrilled to receive her Legend award. One of the great features of the She Rocks Awards is that it not only acknowledges women performers, but also those behind the scenes. An array of amazing music industry women were presented with awards last night too including Roland’s Rebecca Eaddey and Pearl Jam’s longtime sound mixing pioneer Karrie Keyes. As you’d expect, the best was saved until last. The room was abuzz in anticipation of the final honouree, rock goddess Lita Ford. Clearly Lita was ecstatic at having received the accolade and was itching’ to rock out. 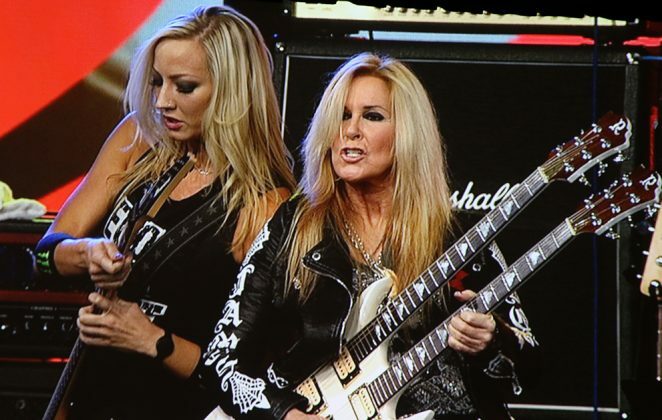 Joined by many of the guitarists featured on the She Rocks album, Lita led the group of girls in a euphoric version of Kiss Me Deadly. The She Rocks Awards, much like the women involved goes from strength to strength each year. Congratulations to Laura on another grand event and her continued work with the Womens International Music Network. It’s the kind of event we might want to think about for Australia!